Tammy Duckworth gave birth to a daughter today. 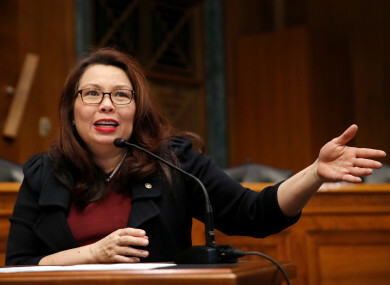 SENATOR TAMMY DUCKWORTH has given birth to a baby girl, making her the first US senator to give birth while in office. The Illinois Democrat, considered a contender for the party’s 2020 Presidential nomination, announced she delivered her second daughter, Maile (MY-lee) Pearl Bowlsbey, today. Her office says Duckworth is recovering well and asked for privacy. Duckworth says Maile’s middle name is in honour of Duckworth’s husband’s great aunt, Pearl Bowlsbey Johnson, who was an Army officer and nurse in World War II. She says she’s grateful to friends and family and “our wonderful medical teams for everything they’ve done to help us in our decades-long journey to complete our family”. Email “Iraq War veteran becomes first US senator to give birth while in office”. Feedback on “Iraq War veteran becomes first US senator to give birth while in office”.